The American has also reiterated his desire to sell the club. 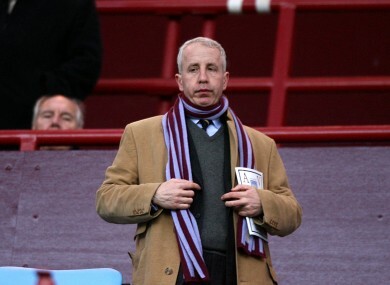 Randy Lerner still wants to sell Aston Villa. ASTON VILLA OWNER Randy Lerner today issued a statement accepting full responsibility for the club’s relegation from the Premier League and also described how the memories of a late Ashley Young goal still “romantically nourish” him. The 54-year-old former owner of the Cleveland Browns NFL team has watched the club unravel this season, winning just three league games, while two managers — Tim Sherwood and Remi Garde — and two directors have left Villa Park this year. Relegation was confirmed with a 1-0 loss to Manchester United last weekend. Lerner’s statement almost mentioned his fondness for the club and he says he believes things will turn around. Email “Randy Lerner takes full responsibility for Aston Villa's relegation”. Feedback on “Randy Lerner takes full responsibility for Aston Villa's relegation”.